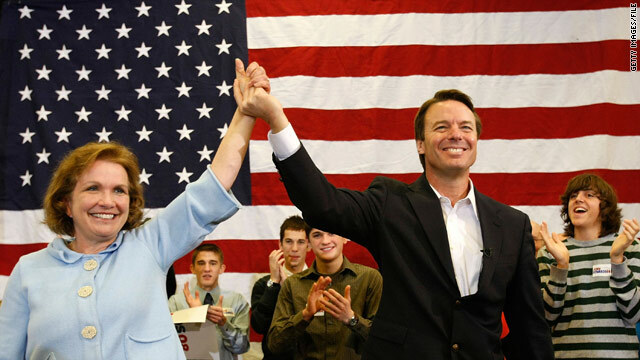 Elizabeth and John Edwards, on the campaign trail in January 2008 in Ames, Iowa, are separating, says a source close to her. Sister tells magazine that Elizabeth Edwards said, "I've had it. I can't do this"
(CNN) -- Former 2004 Democratic vice presidential nominee John Edwards, who admitted last week that he fathered a child with a videographer who worked on his campaign, has legally separated from his wife, Elizabeth, a source close to her said Wednesday. The source would not say when the separation occurred, only that it happened a while ago. The source said he or she spoke to Elizabeth Edwards in recent days, and would not speak on the record because of the sensitivity of the situation. John Edwards issued a statement Wednesday, calling it "an extraordinarily sad moment, but I love my children more than anything and still care deeply about Elizabeth." Elizabeth Edwards' publisher, Random House, released a statement saying, "Elizabeth is moving on with her life and wants to put this difficult chapter behind her. It was an excruciatingly painful period for her and she [has] no interest in rehashing the past." News of the separation comes a week before a tell-all book by Andrew Young, a one-time close confidante of John Edwards, is set to hit bookstores. "Based on the limited portions of the book that have been made available, it is clear it contains many falsehoods and exaggerations," the statement from Random House said. "[Elizabeth Edwards] will not engage in a dialogue on each of the false charges, but would like to set the record straight on two key points. "First, the allegation that she sought to politicize her cancer is unconscionable, hurtful and patently false. Second, she believed Andrew Young to be the father of this child until her husband confessed his paternity to her this past summer. She will have nothing further to say." Edwards, 56, had denied he was the father of his mistress Rielle Hunter's infant for more than a year, saying his self-admitted affair with her was over before she became pregnant. People magazine, a CNN sister organization, first reported the story. Elizabeth Edwards' sister, Nancy Anania, told People magazine in an article dated Wednesday that Elizabeth Edwards told her, "I've had it. I can't do this. I want my life back." The sister told the magazine, "She's got cancer and has young children and totally believes in marriage ... but she can only do so much." John Edwards, a former U.S. senator from North Carolina, sought his party's presidential nomination in 2004 and 2008. On November 3, 2004, the day her husband and Sen. John Kerry, D-Massachusetts, conceded the presidential race, Elizabeth Edwards revealed she had been diagnosed with breast cancer. She discovered a lump in her right breast the last week of the campaign, but said she withheld the diagnosis from her husband to spare him the distraction during the campaign. She announced in 2007 that the cancer had recurred. Last year, she told CNN's Larry King that the medicine she was taking seemed to be working. However, she said the situation was "up and down." Elizabeth Edwards, 60, and her husband have been married for 32 years. They had four children together. The oldest , Wade, died in a car accident in 1996. Spokesmen for both of the Edwardses did not return CNN calls seeking comment.